We have just recently observed the one year anniversary of the tragic bridge collapse in Minneapolis, Minnesota that killed thirteen people on August 2, 2007. Our hearts and prayers remain with those families as they continue to heal from that horrible accident. 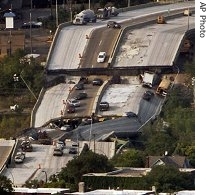 The National Transportation and Safety Board (NTSB) ruled that the collapse occurred because the bridge design was inadequate. The new bridge currently being built in its place across the Mississippi River costs $235 Million and is to finished by December 24, 2008. You may remember that this Minnesota tragedy exposed the Georgia Department of Transportation’s failure to inspect Georgia bridges adequately and I blogged on that back in August 2007. The Minnesota bridge collapse anniversary was a good excuse to reexamine where Georgia is regarding the safety of its bridges. Unfortunately, the answer is not good news. A recent review from the Georgia Department of Audits and Accounts found about 9 percent of the state’s bridges were classified as structurally deficient in 2007. According to TRIP, a national transportation research group, however, twenty percent of Georgia’s bridges are structurally deficient or obsolete. What is going on? Is the Georgia DOT doing anything differently to discover dangerous bridges in Georgia? Or must Georgia citizens wait until a tragedy hits the citizens of this State, as it did the helpless citizens of Minnesota, before our bridges are made safe? Who is looking out for Georgians’ safety on bridges in Georgia? GDOT spokeswoman Crystal Buchanan says “You should go over a bridge and you shouldn’t worry about that bridge falling down.” Do you trust her with your life? ?